The streets of NYC are full of inspiration. If you take the time to stop and smell the roses (or other not so pleasant things) your imagination can run wild, overwhelmed by the sounds, smells and sights of Gotham. A short walk can spark an idea or brighten your day changing it from mundane to magnificent. Yesterday after a long grueling day I was hot, cranky, tired and in great need of a cool refreshing beverage. Trying to avoid the crowds on a busy cross street I opted to walk down a side street in Chelsea stumbling upon a little lady that changed my day, simply by offering me a big smile and a cool glass of liquid sunshine. 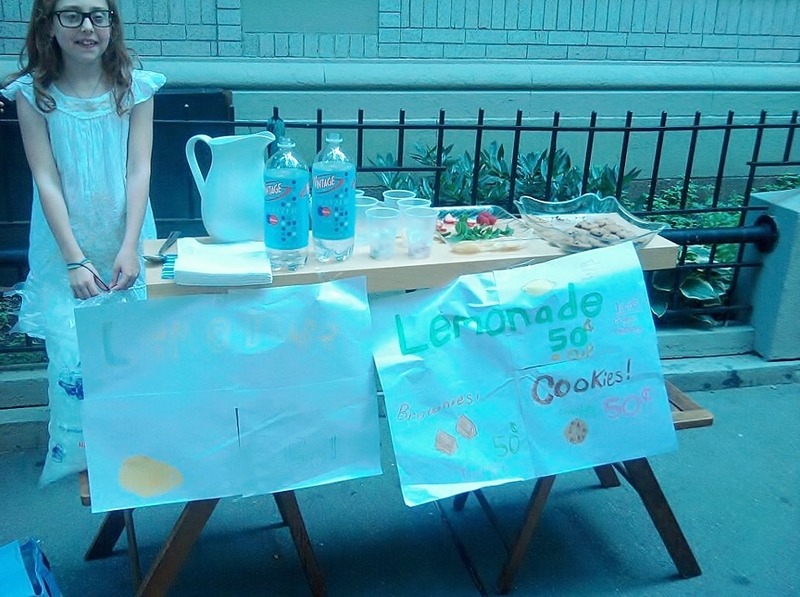 This was not just a little girl selling lemonade, she clearly put a lot of time and effort into her choice and selection. Handing me a small menu she explained I had my choice of sparkling or still, garnish (mint, raspberry or plain) and meyer lemon or key lime syrup. For sweets she offered freshly baked brownies or mini chocolate chip cookies. Her Mom, who was helping out, explained this future foodie had come up with the menu and design of her stand all on her own to save for a special summer vacation. After a cool glass of mint lemonade and a shot of refreshing wide-eyed youth this little entrepreneur sent me on my way with a free cup of strawberries and a new attitude. Just another great NYC moment! Serve with ice, sliced lemons and optional garnish of mint, berries and a smile!